Incredibly easy to use icing. Great piping results every time. No mess and fuss. Perfect for decorating cakes with the kids. 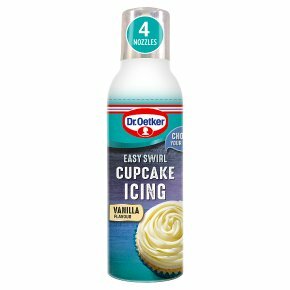 Dr. Oetker Easy Swirl Vanilla Cupcake Icing is easy to use reducing the fuss and mess of a traditional piping bag. A light vanilla flavoured buttercream style cupcake icing that's ready to use straight from the can - great for kids baking. The bottle comes with 4 nozzles to help you create professional and perfect finishes to cakes and cupcakes. Each can decorates around 10 cupcakes and creates the swirled buttercream topping that every baker desires. Wash and dry preferred decorating nozzle before screwing onto can. To begin icing, hold the can horizontally, with the nozzle pointing down slightly. To pipe press down on the tip of the nozzle using your index finger. Pipe a small amount of icing onto a plate to release any air before icing. Use the different nozzles to decorate your cakes, cookies and biscuits. As a guide we recommend that one can will cover approximately 8 cupcakes depending on the size of the cupcakes and the desired effect you want to achieve. WARNING<br>Pressurised container.<br>Do not pierce or burn, even after use. Protect from sunlight. Do not expose to temperatures exceeding 50°C/122°F.